Boosted by the high of capturing their maiden EACA 40 Over title, Liberty Spots Club bowled off their 2015 EACA T20 tournament with a 50 runs victory over East Side Warriors. The 40 Overs final most valuable player, Andre Kirton, followed up his whirlwind 87 off 36 balls in the final with another half-century. Youth player Javed Shakoor supported Kirton well with an unbeaten 29. In defense of 163, Hemendra Ramdihal picked up 3 wickets to wrap up the victory. Hosting the Long Island based ESW at Lido Beach, LSC won the toss and chose to bat first. Antonio Chan (10), Dilly Khilawan (11), Trinson Carmichael (10) and Terrence Madramootoo (12) all got starts but could not push on. The fall of the 4th wicket left the GMA Enterprise and Royal Empress Catering Hall sponsored LSC with 75 runs on the board and with 9 overs remaining. Youth player Javed Shakoor joined Kirton who had already started making dents in into the ESW attack. 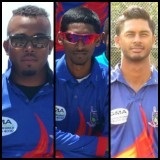 Shakoor played a solid hand while Kirton continued the attack on the fielding team. The pair added 88 runs for the 5th wicket to have LSC finish at 163 for 4 at the end of the 20th over. Kirton hit four 4’s and 1 maximum in his unbeaten 67 while Sahkoor struck 1 four while compiling his LSC best, an unbeaten 29. In reply ESW kept wickets in hand but fell behind the required run rate. The new ball pair of Madramootoo and Tooneshwar Kristona kept things tight before Leon Mohabir and Trinson Carmichael continued to keep pressure on the ESW openers. Mohabir would strike to get the first break through before Carmichael scalped the 2nd wicket. The introduction of Hemendra Ramdihal in to the attack sent the ESW inning crashing. Ramdihal picked up three quick wickets while Vijendra Singh pick up a fourth. By the time skipper Danesh Deonarain picked up two wickets in the final over of the inning the 50 runs victory was all but wrapped up. Bowling for LSC Ramdihal finished with 3 wickets for 15 runs, Deonarain 2 wickets for 2 runs while Mohabir, Sing and Carmichael finished with 1 wicket each. LSC moves on to the second week of the competition where they will complete a double header against Victory CC and Camelot CC to finish off their zone stage games. The double header is scheduled for the Baisley Cage with the first game against Victory CC slated for 10 AM and the 2nd against Camelot CC set for 2 PM. This entry was posted in Eastern American Cricket Association, Lido Beach, Match Day, News and tagged Andre Kirton, EACA T20 Blitz, East Side Warriors, Himendra Ramdihal, Javed Shakoor, Liberty SC. Bookmark the permalink.